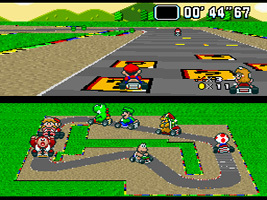 A racing game starring Mario and friends. Choose from eight characters and race around circuits based on locations from the Mario games, collecting items to use against your opponents. The Grand Prix has four Cups with five circuits in each. If you come 4th place or above in a race then you receive points. The player with the most points at the end of the Cup wins. As well as Grand Prix mode, you can also try for the best time in Time Trial or take part in a Match Race against the computer or another player. You can also try the 2-Player Battle Mode, where players must drive around arenas, using items to burst the balloons on the opponents' kart.